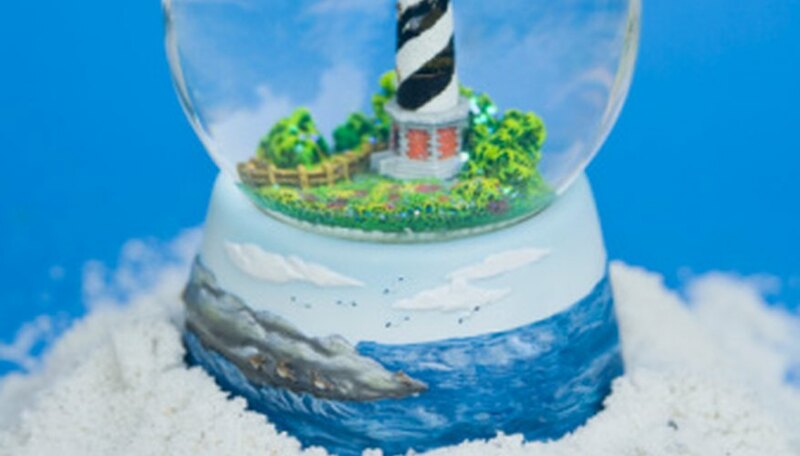 Every child must wonder how the snow and the little figures get inside the glass body of the snow globe. There's no better way to show a child than to make one together. The materials are easy to purchase and some are probably already in your house. Jars with solid screw-on lids fit the bill for the globe itself, although they won't necessarily be round. Sizes will vary depending on your selection. Baby food, jam, mayonnaise, mustard and pickle jars will work well. Just be sure that the jar lids screw on securely. White or silver glitter makes an excellent snow. Extra fine glitter will float, so use regular glitter. Fake snow crystals are available in craft stores. Eggshells with the inner membrane removed can be crushed and used as snow as well. Mineral oil, distilled water or glycerin can be used to suspend the snow. The mineral oil and glycerin are thicker so the snow should fall a bit more slowly. If you don't have distilled water, boil tap water and let it cool. Arrange tiny ceramics or plastic toys in a vignette on florist clay or a plastic lid. The lid will have to be smaller than the lid to the jar being used. Use a single piece like a dog or cat and set it in the center of the base. The size depends on the size of jar you're planning to use. You will need a hot glue gun to mount the pieces of the vignette onto a base. A silicone sealer will be used on the inside of the jar top. Sealants used in aquariums or those used by plumbers are both good choices.